Koh Samui’s island-inspired living is a perfect tropical getaway with friends and family for which Baan Chaba is the place to stay at. With four bedrooms and plenty of lounging space in and around the villa, the holiday retreat hosts a number of facilities and services for guests that you can enjoy. Head to Hua Thanon beach that is nearby for a fun day out in the sun, frolicking by the ocean or building the biggest, baddest sandcastles, or stay indoors sunbathing beside the pool on the many lounge chairs! 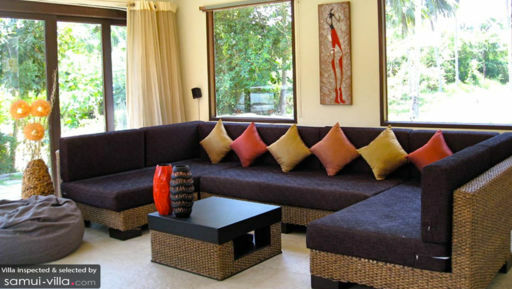 Baan Chaba offers four bedrooms meant for eight people, with two additional beds available upon request. The bedrooms are found spread across two floors, with the upper bedrooms having private balconies. Two of the bedrooms are furnished with queen-sized beds, while the other two bedrooms feature two singles, for your comfort. They are all air-conditioned and feature large windows that let in ample natural lighting and fresh air. Each of these bedrooms comes with an en-suite bathroom, of which one is fitted with a bathtub while the others have walk-in shower areas, along with other necessary amenities. A dark-blue mosaic-tiled swimming pool takes up the maximum space outdoors under the blue skies, dotted with cotton-candy clouds. There are towering palm trees that sway and billow in the wind, also casting their shade upon the ground especially where you will find the deck chairs, ideal for sunbathing, tanning, and dozing off in the afternoons. The villa also provides BBQ facility so you can enjoy freshly-grilled delicacies and make the most of your holiday. There is an alfresco dining area as well, upon which you can enjoy hearty meals while also breathing in the fresh, island breeze! The contemporary living area at Baan Chaba is open-sided with floor-to-ceiling glass windows that overlook the luscious tropical gardens outside. The living room also features sliding glass doors, opening out directly to the gardens so you can simply head outdoors without any obstructions. With simple and easy-on-the-eyes décor, the living room is truly a relaxation haven offering a peaceful sanctuary away from prying eyes and noise of big cities. Connect with your inner-self and find peace in the smallest of things as you lie back on the sofa, enjoying a moment to yourself. For dining purposes, Baan Chaba offers alfresco dining beside the pool but that’s not all as there is another 10-seater dining table inside the living area, also offering splendid garden and pool views from the glass windows. Guests can enjoy a delicious, piping-hot meal as they gaze at the natural splendour outdoors. A fully-equipped, open kitchen is found in the far-right corner, as it is fitted with modern appliances like a coffee machine for the freshest brew to wake you up in the morning, a toaster popping bread like there’s no tomorrow, and a super strong refrigerator for chilled drinks and things! 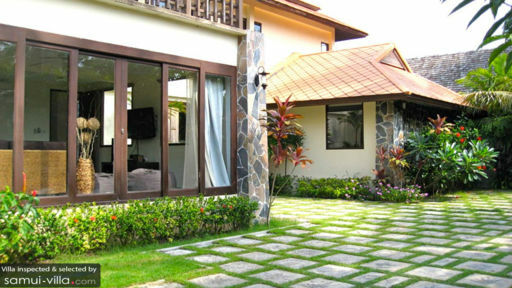 The villa hosts a number of services offered by the staff including housekeeping, handyman, gardener, as well as an on-call villa manager. If you’re traveling with an infant, then the villa provides a baby-cot, free of cost. Special services like massages, tours, babysitting are available upon request at an extra cost. 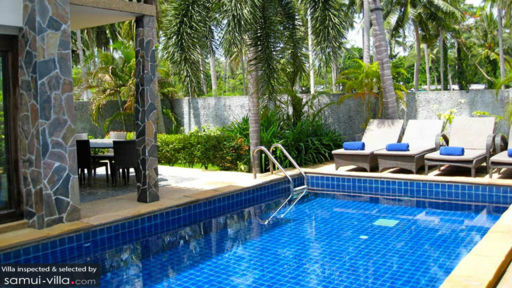 The villa is located on Hua Thanon beach which is very close to a lot of the major attractions in Samui including the Butterfly Garden and the Samui Aquarium. Being close to the beach, you can always indulge in a number of watersports like jet skiing, snorkelling etc. Some of the best restaurants are found in the vicinity including The Fisherman’s Outlet and Krua Chao Baan!